Toys, toys, toys. Beyond the comics, I have a fondness for action figures and know many people who share that love. While most of my collection consists of comic characters, video games and anime characters are well represented. 2011 was a great year for toys. I purchased many action figures throughout the year and thought it would be cool to pick my top five of the year. This gave me a chance to look through pictures of my hauls from the previous year. That's not to say I don't do that anyway, because I do. It took me some time to look through everything because I wanted to make sure my initial list was made up of toys actually released in 2011. From there, I had to narrow down my choices, which wasn’t as hard as I originally thought for a couple of reasons. One, there are a few figures who were standouts to me and were clear choices. And two, I’m only collecting about 3 current toylines including Marvel Universe, G.I. Joe, and Gears of War. But those are the only actual full ongoing toylines, it’ll be four when Marvel Legends hit shelves again. I’m not counting the figures connected to movies. Getting that out of the way, let's get to the toys. Because that's why you're here, right? And to the toys we go. I found this lovely vehicle at Toys R Us. I really dig this new design. I have three of them; one of each release. And yes, that includes the inexplicable brown one. I planned on painting that one black, but then I got my hands on the second release which was black. I still want to customize it, but have yet to decide on a design. Hasbro decided to release it a third time, in glorious red, or crimson as the box dictates. The actual color isn’t as glossy as the box would indicate, but it still looks good. 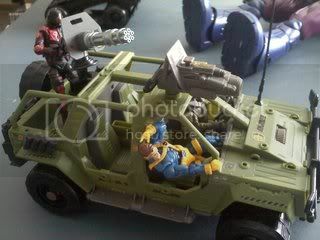 I don't really care for the driver Cobra Crimson Horseman. 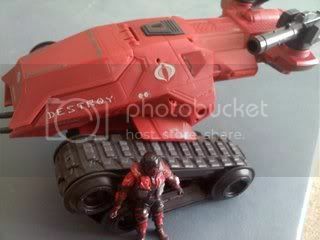 I hate the mold they used, it's the same as the PoC wave 1 Firefly. The Firefly I didn't like then. But since I keep all my drivers and pilots anyway, he'll always have a home. I know what you’re thinking. Two G.I. Joe vehicles? Really? Yes, really. I found this along with the Black Dragon VTOL at Wally World. This new Vamp design is my ideal Joe vehicle. 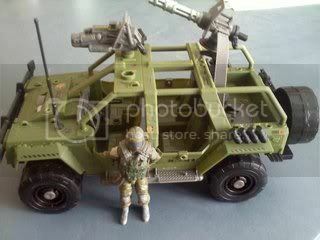 And that model is a jeep/tank type vehicle fitting 4 or more figures. Because of this, it has actually become my favorite Joe vehicle. It has taken the spot of the A.W.E. Striker which has been number one for many years. I actually have two Vamps; both the PoC one and this 30th one. It joins the new Hiss and the A.W.E. Striker as the only vehicles of which I have multiple forms. I don't find the driver Steel Brigade Delta as cool as other people on the internet. 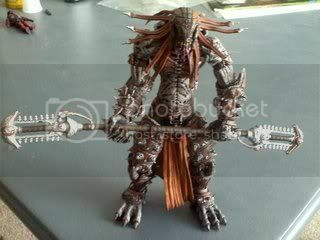 But I definitely like him much better than the Cobra Crimson Horseman though. I’ve been a gearhead since I played the first one and absolutely love the franchise. I’ve got the games, novels, comics, cog tags, a shirt, other apparel, and of course the toys. When NECA Toys announced Skorge, I couldn’t wait to get my hands on him. I had him set as my default Locust character in Gears 2. His mask or hat or whatever it was looked like dreads. I found him over the summer at TRU along with Kantus. The articulation is getting better on these figures. The first sets were pretty much statues. This deadly Locust comes with his dual-edged chainsaw staff. If you don’t know, I’m a big X-Men fan. Always have been and always will be. As such, I’ve seen the Sentinels in action many times. I’ve had them in toy form before too. Hasbro produced these Sentinels in two colors. These classic colors were originally the SDCC 2011 exclusive. The other version, painted in silver and blue. 2011 marked my first trip to SDCC so I was already geeked out. But when I heard about the Sentinel, I knew I had to do what I could to get my hands on at least one. I won’t go into all the details, but anyone who’s been there knows the effort it takes to get some of Hasbro’s exclusives. 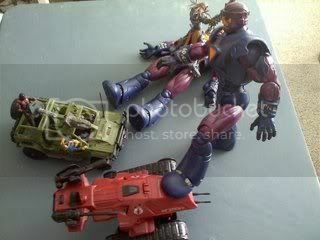 It came in a large box covered in art by Joe Quesada featuring six X-Men taking on the mechanical mutant killing terror. It even has lights and sounds. I originally planned to purchase two, but several factors came into play that made me stick to just the one. One of those was the size. I had trouble packing the one away; two would’ve been a struggle. I even carried it on the plane ride back. I wasn’t letting that Sentinel out of my sights for anything. I did receive several strange looks at the airport, but of course I didn’t care; I had my Sentinel. However, sometime after the convention, Hasbro Toy Shop got in some of the formerly SDCC exclusive items. I didn't spend any time deciding on whether to grab a second one and I’m glad. As I told a friend, I couldn’t have just one Sentinel. These top two spots could’ve been switched around. That’s how close it was. But in the end, it had to go to Slim. 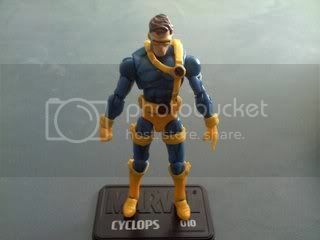 Cyclops is one of my favorite comic book characters and I think he’s the best and most important X-Man ever. And despite all the unexplained pouches, I’m a huge fan of this costume. I actually picked up two, having gotten more into MOC figures. He’s got great articulation which includes the new rolling ankle joints. An awesome figure all around. And just for fun, here are some more pix for you. I may have had a little fun with this. 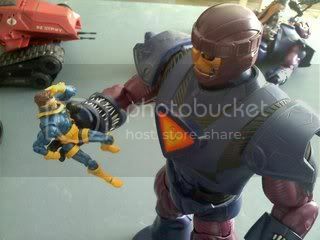 Not that much, but you know you thought of Night of the Sentinels with Cyclops and that Sentinel, didn't you? Yeah you did. So there you have it ladies and gentlemen, my top five toys of 2011. There are a lot of toys coming out this year that I can't wait to get my hands on. Most of it will be Marvel stuff; Marvel Universe of course and the return of Marvel Legends. I wonder what SDCC exclusives Hasbro will have. What a year this will be indeed. Feel free to comment. And thanks for looking. The Sentinals drinking coffee. 2012 picture of the year. There is no need for anyone to even try. Lol, thank you sir. I'm quite proud of that one too. 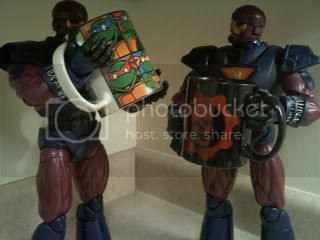 I had just opened up the second Sentinel and had the new fanboyish coffee mugs sittin around.